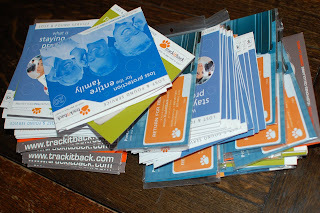 I purchased this mountain of stickers from trackitback, a service that facilitates the return of lost items. I also bought a frozen pie (and a mountain of dry ice), a notepad, and $20 in random gift cards. I don't really place much value on the goods themselves, as the main purpose of these transactions was a bonanza of US Airways frequent flyer miles. Without setting foot on a US Airways aircraft, I have purchased a balance of miles sufficient to redeem for four roundtrip tickets to Australia. In business class! Although I've only consumed half of the balance so far, the cost of purchasing (business class) flights via these miles has worked out to be $91.64 per flight, or 3.9 cents per mile travelled.